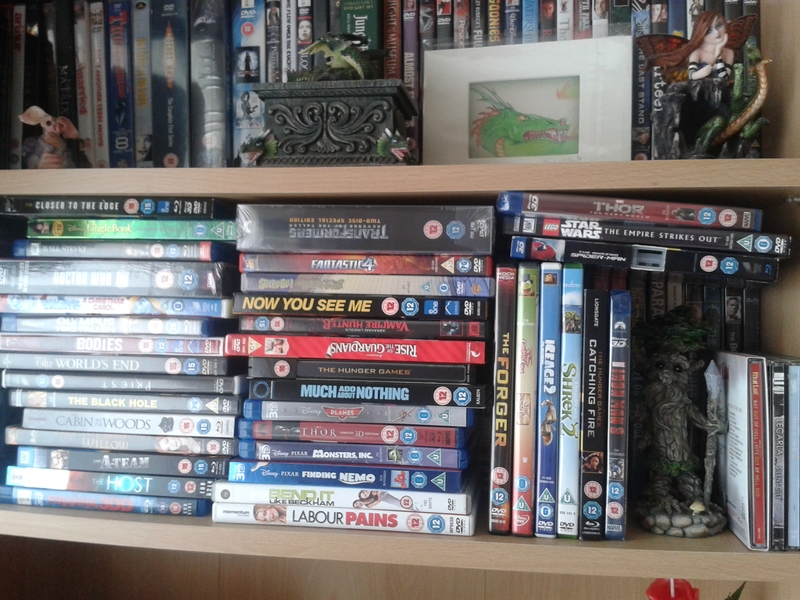 I’m a DVD/Blu Ray collector. I like to own physical media over electronic copies of anything, including books and music. However, my growing collection has taken over the living room. Here’s one of our bookcases – the tidiest one! Problem is, even though our bookcases are generally tidy. 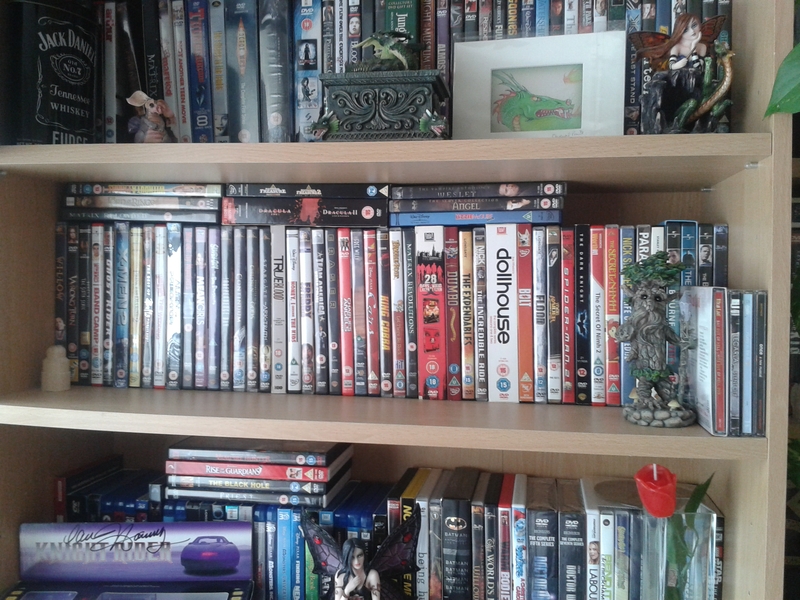 I can never find the DVD or Blu Ray I want to watch. There’s no organisation. When we moved into this house, we simply piled them on, along with our books. I had thought about putting them into DVD binders or into filing boxes, after reading numerous ideas about this on a bunch of blogs about DVD organisation and media organisation. However, I like my collection on show. Especially to showcase some of the signed items I have. I decided to rearrange them all into ‘genres’, another idea was alphabetically but when I go to watch a film it’s usually with a type in mind rather than a title. While re-arranging, I also purged my collection. Finding some duplications in my collection! I ended up needing to move some of my Stephen King book collection (he’s one of my favourite authors), to the small bookcase in the small bedroom. At some point, my plan is to re-vamp the bookcase, it’s vintage and has been in my family since my uncle was young, so it’s over 60 years old. NB. This is an in progress photo. Oh and I don’t know if you are interested or not, but I actually keep a google spreadsheet with all of my dvds listed. Just so I can keep track of which movies/tv show seasons that I actually have. So when I am out and about and see one I want, I can verify if I own it already or not. I also still own a lot of vhs and so I can keep an eye out for dvd copies of the movies I still have on vhs. It’s a great referencing system, especially because it’s online and not just a file on my computer. I can access it from anyway. Just a suggestion! Yay! A fellow DVD collector! 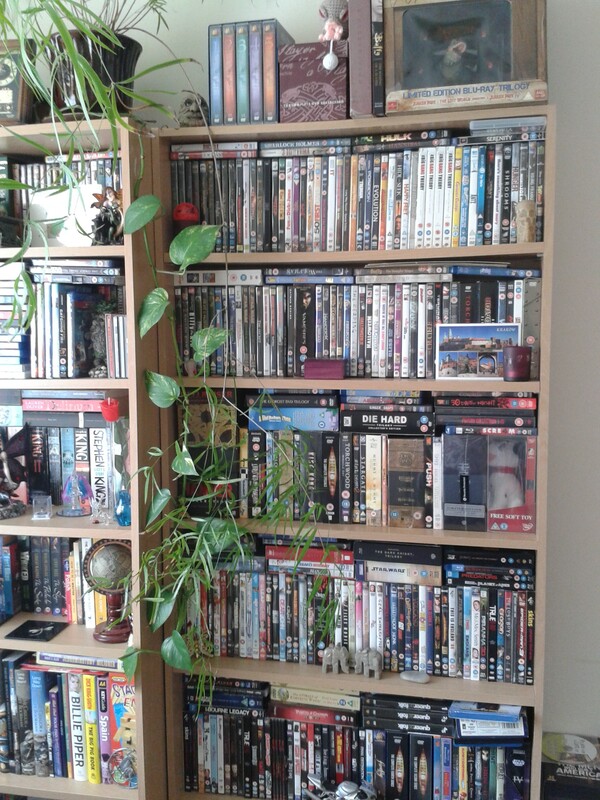 🙂 Nice to know I’m not the only one, that enjoys having actual DVDs and their collection on display.